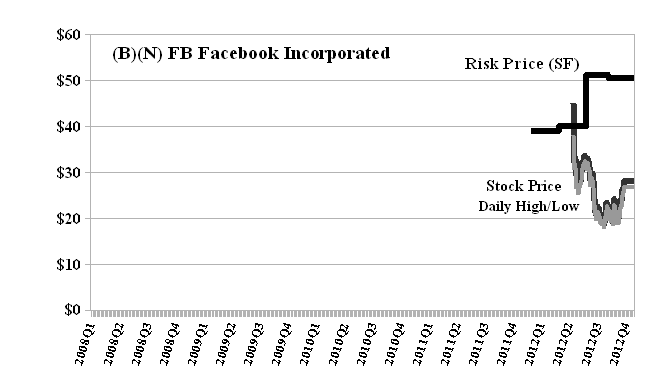 Because those questions were unanswerable at the time, we passed on the recent IPO (Initial Purchase Offer) for FB Facebook Incorporated in May because there was no way for us to quantify the downside risk and no way for us to protect our investment against THE RISK which is the possibility that we might not ever get our money back – possibly none of it – or a hopeful return above the rate of inflation which, after all, is only 2% to 3% per year at the present time. That doesn’t seem like a lot to ask from such a well-regarded and ambitious company but the bets on Facebook opened at $38 per share for an imputed market value of $80 billion and a gambler could obviously buy one million shares for $38 million and still not “own” even one percent of it (echoing our question of what is it that we own when buy common stock?). Had they waited for less than two months, they could have bought twice as much for the same money (please see Exhibit 1 below) and had they been astute enough they might have unloaded it for up to $45 at some time in some private deal, apparently. But is it a bargain now? For example, today’s stock price is $28 (please see our Post, Do Stock Prices Mean Anything?, November 2012) and it has run between $17.50 and $45.00 this year for a demonstrated downside volatility of minus (-$8) in such a short time. The January 2013 put at $28 is asked at $1.95 per share and the short call at $30 on our long position in the stock (if we had any) can be sold for $1.10 so that for a net cost of $0.85 per share we can lock in a stock price of no less than $28 and no more than $30 for the next month and the price goes up by 5¢ (net $0.90 per share) if we wanted to hold that position until March. The “hard” (not sentimental) math says that we could pay $28.90 now for the possibility of receiving possibly $30 and a “profit” of $1.10 or 3.8% in three months time (or sooner) but no less than $28 for a loss of $0.90 or minus (-3.1%) per share and no dividends. A really big player such as a hedge fund might take a still larger position and advocate for a management and Board change but what are they buying? There are 2.1 billion common shares outstanding with a current market value of $60 billion, total assets of $16 billion and net worth or shareholders equity of $14 billion and the Risk Price (SF) is $50 per share (please see Exhibit 1 below) so that unless they can “pump” $50 a share for it and into it for the common weal, so to speak, there will always be a downside risk of $50 less whatever they are willing to pay for it. Stranger things have happened. Please see, for example, our recent Post on Initial Purchase Offers (IPOs), November 2012, or any of our recent Deal Book cases, and for more information on THE RISK and how we avoid it, please see The Perpetual Bond™. Facebook Incorporated operates a social networking website. Millions of people use Facebook everyday to keep up with friends, upload an unlimited number of photos, share links and videos, and learn more about the people they meet.